This is where the foot flattens and the weight collapses inward or toward the midline of the body. Just look at these flat feet! It is a very common musculoskeletal deviation in the body and cause chronic pain all the way up the skeleton. Pronating the feet can irritate the plantar fascia on the bottom of the foot causing fasciitis. Over time this imbalance in the body can cause overuse and pain in the ankles, knees, hips, and even up in the back. Pronation refers to the inward roll of the foot during normal motion and occurs as the outer edge of the heel as it strikes the ground and the foot rolls inward and flattens out. A moderate amount of pronation is required for the foot to function properly, however damage and injury can occur during excessive pronation. When excessive pronation does occur the foot arch flattens out and stretches the muscles, tendons and ligaments underneath the foot. The lower leg turns inward putting the knee and hip out of alignment causing the back to be rotated. Ouch! Find out other reasons why your feet might hurt here. 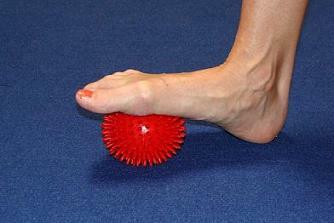 Standing or sitting roll the bottom of your foot over a spiky reflexology ball or a golf ball. Roll it back and forth and over any sore spots for up to 2 minutes each day. Use a softer ball like a tennis ball if you have very sore feet. You should feel slight discomfort only when doing these foot stretches. Find out more ways to strengthen and stretch you feet here. Helps to correct pronation and supination problems with the feet and strengthen the ankles to support these imbalances. For Foot Supination: Place ball or pillow between feet and invert or squeeze the ball between your feet, hold for 2 seconds and relax, repeat for 10 repetitions. To see these and many more exercises for Foot Pronation and other common foot ailments check out the brand new Foot Ebook available here. Place a ball or pillow on the outside of the foot against a wall or solid object and evert or press the foot outward into the ball to strengthen the lateral side of the foot and ankle. Press on hold for 2 seconds and relax, repeat for 10 repetitions. 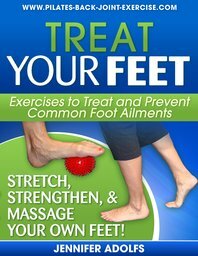 Check Out Our Favorite Recommended Foot Ebook to Treat and Prevent Common Foot Ailments! Get Instant Access to Loads of Color Pictures, Exercises, and Information Designed to Stretch, Strengthen, and Balance out your Feet. Learn how to Treat and Strengthen your feet so you can Enjoy Life Again!